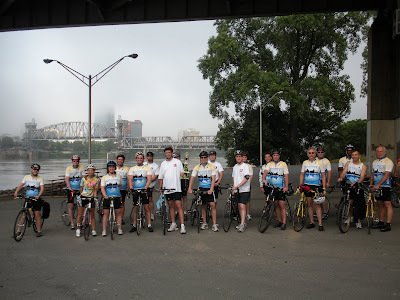 More than 20 Garver employees in our North Little Rock, Arkansas office participated in this year's Bike to Work Week event hosted by the Bicycle Advocacy of Central Arkansas. For the second year in a row, Garver won the trophy for the largest percentage of riders in our business size. Also, Garver's Fayetteville, Arkansas office is defending its title as the highest average ridership in the city's biker commuter challenge. This year, seven Garver riders participated in Bike to Work Week events. The winning business will be announced on Friday. Project Engineer Brandon Bynum had the furthest commute - 15 miles one way. Later this week I'll post a list of upcoming biking and running events across our region.